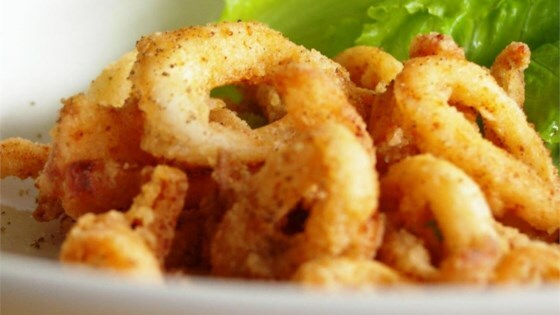 "My mom always cooked this recipe when I was a kid: deep fried calamari. This is one of our family's favorite foods. Simple yet very delicious." Rinse and drain squid well. Pat squid dry with paper towels. Sprinkle salt on squid. Put flour and a few squid in a small paper or plastic bag. Shake the squid rounds in the bag until coated. Remove squid and place more in the sack to coat. Heat oil in a medium size frying pan over a high heat. Fry the calamari in the oil until golden brown and crispy. Drain the calamari on paper towels. Serve hot. Not sure I would rate this as a recipe - put the squid in flour and fry. Guess I was looking for more like different spices, etc. Thanks anyway for posting this - a good place to start.